Curiosity begins with a seed: In an effort to encourage whole food snacks and spark curiosity, a planter was placed in the K1 lunch area. 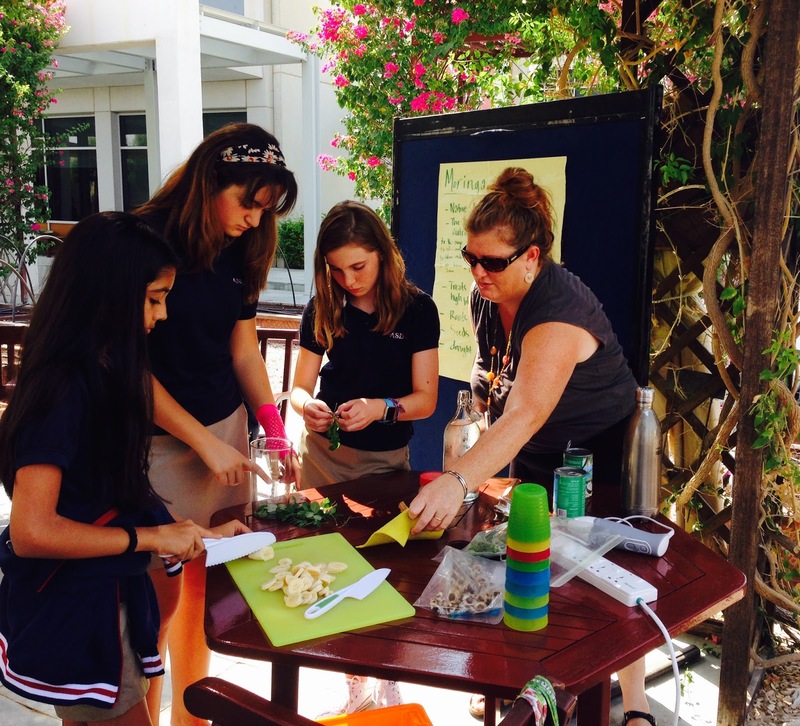 Students have been encouraged to plant any seeds from the veggies and fruits in their snacks. 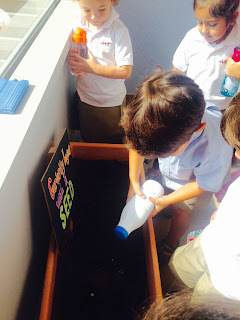 Last week there was great excitement as the K1 students discovered their first sprout. The students are engaged in making predictions of what it might be... inquiry in action! Moringa smoothies: Did you know that this native tree from India is one of the most nutrient dense leaves on our planet? Among its many amazing qualities is that it contains 7 times the Vitamin C of oranges, 3 times the potassium than bananas, and 4 times the calcium than milk. Ms. De Leon’s grade two class and Ms. Olliffe's grade seven health class got to experience the health benefits of Moringa by making Moringa smoothies in the garden. Learning through the senses rocks! Marigolds for the garden: Planting marigolds in the any organic garden is a must. They aid in pest control and attract pollinators, both great ways to identify benefits of healthy ecosystems and, more practically, a perfect way to talk about practical gardening! Grade 2H and 2D helped make marigold seed packets and tried a healthy snack of celery sticks, cream cheese and cranberries. Yum! Bird Seed Adopters: One facet of organic gardening is to feed your predators. As you might suspect from the name, this ensures both that we have a healthy population of birds around campus and also, and perhaps more importantly, it keeps the birds away from the garden. This small service is hugely helpful in ensuring a positive learning experience for our community, and it looks great too! 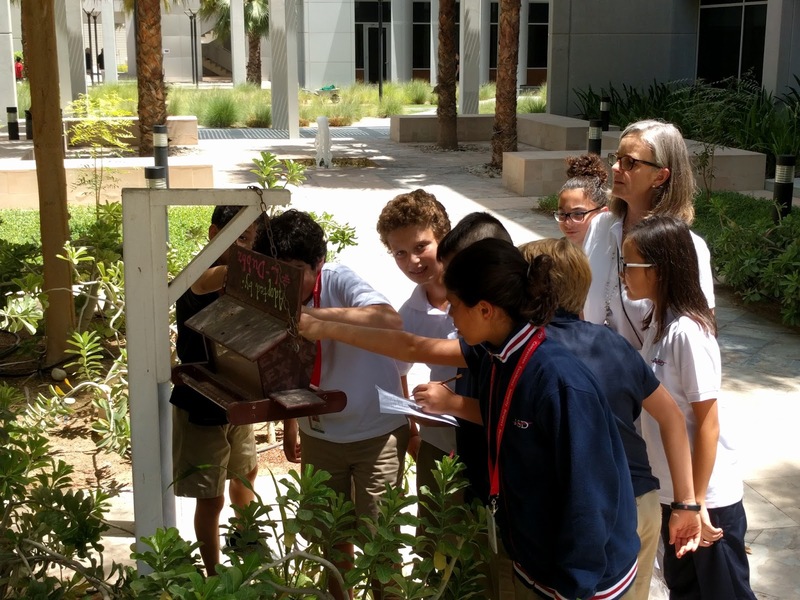 Every year, classes volunteer to supply bird seed to the various feeders around campus. It's quite a beautiful sight in the calm of the morning to see students meandering through our campus and taking brief moments to show caring for the natural environment. What a great month it's been! As we reach September's end ,it's great to know just how much is already going on. And to think that this post is only focusing on one space in a one month period! Add to that the great many conversations that matter inside and outside classrooms, the hundreds of hours spend inquiring, investigating, planning, acting on issues and reflecting on it! These are some essential skills in developing world contributors. It seems like we're well on our way!